"Co-working spaces and small business incubators are cropping up more and more in major cities and allow start-up entrepreneurs... physical interactions necessary for effective collaboration whilst sharing the cost of renting the space." PlusConcept SPACE is just that and not only catering to start-ups, but also successful entrepreneurs, advanced businesses or overseas set-ups in Singapore who are looking for a productive, secure, 24/7 office location. The location of our co-working spaces and shared offices on Purvis street in Singapore further adds to this character. Недавно открывшийся коворкинг в центре Сингапура устроен как одно большое открытое пространство. Рабочие места не фиксированы, можно выбирать, где кому удобнее работать. Местные стулья со специально разработанными спинками — гордость коворкинга. Кроме того, здесь есть небольшая комната для встреч, душевые, кладовая и терраса. Маркус Кауб, сооснователь PlusConcept Space: «С учетом характера нашего основного бизнеса — маркетинг и консультация в области недвижимости в Азии — у нас у самих довольно свободный график работы. Несмотря на это, мы поняли, что собственный офис улучшает нашу личную продуктивность и представление о современном бизнесе в целом. Этого не понять, работая в одиночку дома на кухне. Я сам опробовал много коворкингов в Азии и Японии, и меня всегда очень привлекала концепция и синергия коворкинга — разделять рабочее место с правильными людьми. Азиатское коворкинг-движение началось с Японии, в Токио. Начать собственный бизнес и снять офис было дорого и сложно, поэтому работа в коворкинге стала удобной альтернативой. Несколько лет назад я исследовал Сингапур перед тем, как переехать, но здесь практически не было альтернатив стандартным офисам в аренду. Сейчас цены на аренду земли существенно выросли, вместе с ними выросло и предпринимательство, и коворкинги стали популярными. Сама концепция коворкинга примерно такая же, как на Западе, с той разницей, что в Сингапуре нет никакого хайпа вокруг сообщества. Местные люди более закрытые, они ориентированы на бизнес. В нашем коворкинге, в основном, постоянные посетители с фиксированными рабочими местами, всего около 20 рабочих мест. Так как мы открылись недавно, сейчас заполнено 40% пространства. Недвижимость здесь очень дорогая, нужно много инвестировать в проект, особенно в начале. Самый лучший вариант сейчас — зарабатывать столько же, сколько платишь за аренду, но кроме аренды есть много других затрат. Среди дополнительных опций мы предлагаем создание фирменных логотипов и консультации в области развития бизнеса. Наша главная задача сейчас — заключать контракты по аренде мест на 3-6 месяцев. Мы не проводим семинары в коворкинге — в первую очередь хочется, чтобы люди у нас работали. События — это очень интересно, но мне кажется, большинство коворкеров приходят, чтобы сделать дела. Им нужна хорошая рабочая атмосфера, чтобы было с кем поговорить, перекинуться идеями или поделиться ресурсами. Реклама места — дело не быстрое. Но это как курица и яйцо, чтобы эффективно рекламировать, вам нужна концепция и уже существующий проект. А когда проект уже существует, вам надо отбивать аренду и сразу инвестировать в него. Нельзя быстро заполнить место, надо быть готовым, что прибыли не будет с первых дней». Business travellers, freelancers and general workaholics know all too well the ordeal that goes along with having to work from a ‘café office’. Yapping baristas, whining kids and bad music often make coffee shops unpleasant places to get things done. This is where co-working spaces step in. For a daily or monthly fee, a co-working space provides tenants with a desk, office infrastructure, round-the-clock operating hours and even coffee-making facilities. These spaces take elements from internet cafés, business centres, serviced offices and coffee shops and roll them all into an innovative business concept. A group of IT professionals based in California conceived the co-working concept back in 2005 as a way for groups of likeminded people to come together to work. In Cambodia, Colab is one of the first to enter the market. The “affordable, flexible and fun” space, in the increasingly urbanised Russian Market area of Phnom Penh, plays office to professionals from diverse fields and faraway lands. Canadian web designer and Colab co-founder Justin Pearce-Neudorf said Colab offers tenants “all the benefits of an office”. Norwegian Ole Rosendahl joined Colab to avoid working from home. “I worked from home for three years. I missed a community,” he said. In joining Colab, not only did he find a community, but also two fellow professionals with whom he has teamed up to work on an internet service provider for a company in Norway. An entire industry is emerging. There are now online co-working magazines such as deskmag.com; conferences, such as the Co-working Conference Asia; and books being published with titles including: Working in the UnOffice: A Guide to Co-working for Indie Workers, Small Businesses and Non-profits. Amarith Charoenphan, founder of Hubba, a small co-working space in Bangkok’s fashionable Ekamai district, expects a multitude of new spaces to pop up throughout Thailand in the near future. A social enterprises consultant by trade, Charoenphan has already launched a Hubba joint venture in the northern city of Chiang Mai. In Singapore, Markus Kaub founded Plusconcept, one of the first co-working spaces in the city, three years ago. However, the German business development consultant noted that an initial boom in co-working spaces in the city-state has cooled. “Right now, I’m not aware of any new co-working spaces having been set up in the past six months or so,” he said. This may be due to a certain diversity in the co-working space business model. 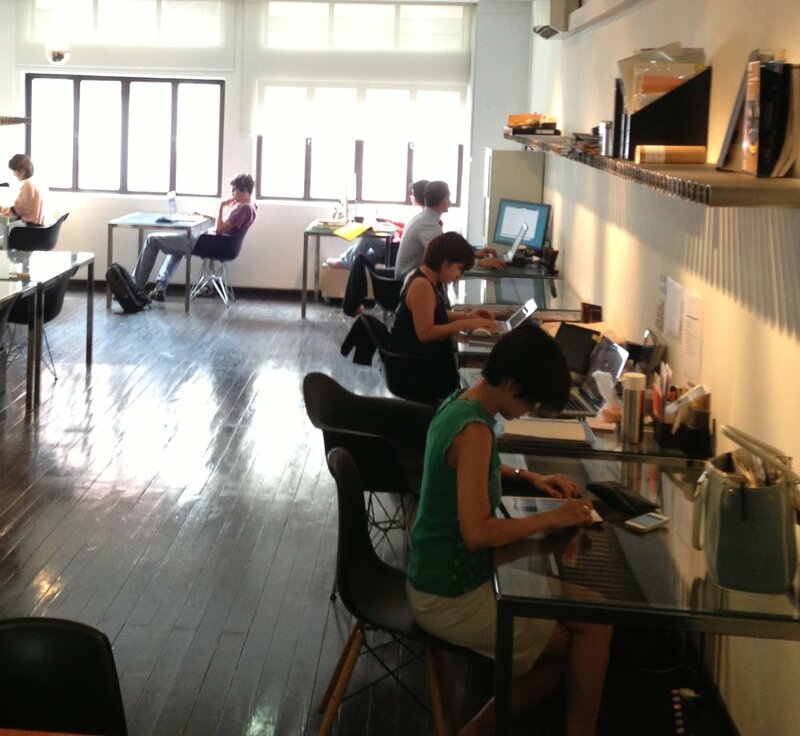 Backpacking university students, working on their theses between party nights, find a home at The HUB in Singapore. Meanwhile, a Singaporean oil company, a Vietnamese architect and a public relations firm from Switzerland enjoy the minimalistic design of Glowfish in Bangkok’s glitzy Asoke Towers. More relaxed is Charoenphan’s Hubba, where “freelancers, startups, designers and journalists can use the beautiful garden for a break or take a few stress-releasing jumps on the trampoline”, according to the founder. Fiona Arjandran works from her desk at Paper & Toast, a co-working space in Kuala Lumpur’s business, shopping and nightlife district of Bukit Bintang. The Indian-Malaysian is employed by a fashion company, which pays for her desk. According to Arjandran, her favourite co-worker is the cheerful Kim Choong, editor of Thirst Magazine, an online drinks journal that aims “to improve the drinking culture in Malaysia”. Choong’s role explains the variety of tipples found on her desk. “Sometimes we enjoy a drink together,” she said with a grin. Back in Cambodia, Phnom Penh’s SmallWorld is an altogether different kind of co-working space. The graffiti-covered house certainly stands out among the huge, newly constructed villas that are common in Toul Kork district. Networking is a common feature of co-working spaces throughout the region. The majority organise networking events ranging from collaborations with international chambers of commerce to expert panel discussions. We are happy to represent and share our insights about Singapore Co-working at the Coworking Asia Conference in Tokyo. Thanks for inviting our PLUSCONCEPT | SPACE. Thanks for considering our space for this. We usually don't have that much drama or 瑞恩 Rui En at our shared office. Happy to have our shared office make an appearance in the Sunday Times Life! section of the Straits Times. Very nice an stylish article about co-working and pro shared offices around the world inclusive Singapore. Thanks to alongside other very fantastic great spaces in London, New York, LA, Hong Kong, Belgrade and Singapore.